Keep partying, the cavalry’s just round the corner – and they’re dressed in miracle green. 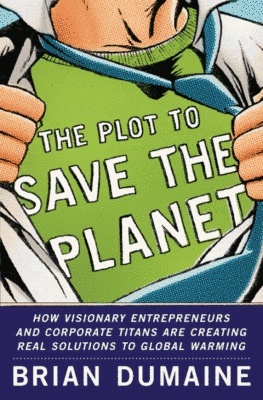 I’ve been reading Brian Dumaine’s “The plot to save the planet: How visionary entrepreneurs and corporate Titans are creating real solutions to global warming”. There is no question about it. It must be cleaned up. Carbon-·capture technologies, where the CO2, emitted from coal is buried beneath the ground, should eventually become feasible. New approaches, such as using algae to eat the carbon in coal exhaust, may also become commercially viable. Will we be able to develop the technologies fast enough to meet this goal? But there’s very little recognition of actually reducing consumption. I’m not criticizing missionaries for saving the globe, nor advocating a damper on travel. But conservation is the low-hanging fruit for healing our ailing planet. Everyone wants to live a rich, abundant life, and there’s nothing wrong with doing that. In fact, it is a goal society should strive to achieve for as many citizens as possible. Despite the high prices and fuel shortages, when a cardigan clad President Carter asked citizens to turn down their thermostats and drive less, he was accused of fostering “an age of malaise.” Americans were vividly made aware of the risks of having an oil-dependent economy. But we won’t be able to achieve this without advances in technology. It’s important to recognize that we’re not going to save our way out of this problem. On the Continent, the streets are narrow, the cities dense, and the distances short…and besides, Americans love their cars. Climate change is not solely an American problem. Carbon emitted from Chinese coal plants warms the entire globe. Which leads to a disturbing concept of ownership of the earth. On page 11 Dumaine uses the “our” indicate American collective ownership “What are the obstacles to cleaning up our planet?”. An otherwise enlightened passage about a discussion about the effects of climate change with an uncaring banker reaches its climax with “millions of refugees displaced by floods and famine who might head north toward the U.S. border” (which he sees as a “bleak scenario”). While Dumaine is frightenly Americentric, we need to be careful not to assume that we are immune from such thoughts. After all, the NZ government decided recently that it was only “fair” for us to target reductions nowhere near the global average. the book is all about producing more and more energy. So, we have chapters on developments in algal technology that will “munch carbon”, on the ‘rebirth of the nuclear industry”, and he celebrates Schwarzenegger’s ethanol powered Hummer. In only one chapter (3) does he come close to addressing the real issue, reducing consumption, indeed he describes this as “the first task”. Using the world’s resources and then buying carbon offsets may soothe your conscience, but it is not a solution. The hedge fund millionaire who flies his private jet to Aspen to stay two weeks a year in his “green” 10,000-square-foot vacation home ten miles from town is not helping the climate. The health-conscious jogger who sips Asian bottled water should note the required energy to produce and ship each bottle to the United States. And the organic-minded shopper who buys raspberries in the middle of winter should understand that they have traveled from Chile in a plane that was spewing CO2 all along the five-thousand-mile route. The cleanest, greenest power plant is the one that is never built. What if the utilities got paid for generating less electricity? As he explains, “Essentially what I am proposing is that I eventually go beyond your meter and into your house. I might put in a more efficient refrigerator. Paul Hawken…complained about the growing popularity of so-called sustainable products, whether jeans or furniture built with wood from replanted forests. “Green consumerism is an oxymoronic phrase,” he said. “We turn toward the consumption part because that’s where the money is,” Hawken said. “We tend not to look at the ‘less’ part. So, to conclude, and borrowing from Krumdieck, Dumaine’s book seems to me not a plot to save the world, but a vector of a disease, a disease that is causing paralysis when we need to be moving. In other words, this book is contributing to a misguided belief that technical solutions will miraculously save us so meanwhile we can go on partying. I am becoming increasingly sensitive to the America-file perspective and the all too prevalent inability to consider the world from anything other than that. The self referential nature of it is all through the academic literature I read, the culture I see, and most recently – everyone I met in that great big land. The solution has to be elsewhere. We western followers need to learn languages other than American English, and fast! Shame I missed her talk.. was it recorded?